A perfect combination of luxury and versatility, the compact crossover class is a popular alternative for families on the go. Armed with a sleek design, capable engine options, premium luxury amenities and an arsenal of innovative technology, the all-new 2017 Jaguar F-PACE promises to take the luxury crossover class by storm. Learn more about the Jaguar F-PACE with this in-depth 2017 Jaguar F-PACE vs 2017 Mercedes-Benz GLE comparison. When you explore the luxury compact crossover class, you will be hard pressed to find a more exciting model than the 2017 Jaguar F-PACE. Available in five trim levels - Jaguar F-PACE, Premium, Prestige, R-Sport and S - the Jaguar F-PACE can be tailored to fit your lifestyle. An impressive list of standard features includes 18-inch wheels, a power liftgate, LED running lights, a panoramic sunroof, LuxTec luxury interior, an eight-inch InControl touchscreen display, an 11-speaker Meridian sound system and more. In addition to a luxurious interior, the Jaguar F-PACE makes room for 33.5 cubic feet of cargo space behind the second row that will transform to 63.5 cubic feet of space. What Are the Differences Between the Jaguar F-PACE and the Mercedes-Benz GLE? 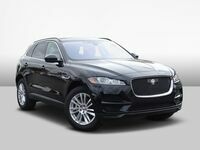 Are you looking for a power-packed luxury crossover at an affordable price? Look no further than the Jaguar F-PACE at Barrett Jaguar. When you explore price and affordability in this 2017 Jaguar F-PACE vs 2017 Mercedes-Benz GLE comparison, you will find that the Jaguar F-PACE is the more affordable alternative. 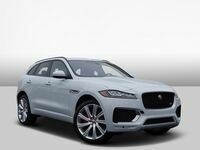 With a starting price that stands at just $42,390 with a powerful supercharged engine or $40,990 when equipped with the turbodiesel platform, the Jaguar F-PACE comes in at a much lower price than its Mercedes-Benz competitor. 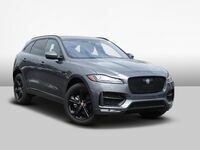 Jaguar F-PACE models are available with two potent engine options that can be equipped to all trim levels, except the top-of-the-line F-PACE S grade. Standard 2017 Jaguar F-PACE trim levels are available with an elite 340-horsepower 3.0-liter supercharged V-6 engine that is paired with an eight-speed automatic transmission with paddle shifters and standard all-wheel drive. Fuel-economy ratings for the power-packed Jaguar F-PACE stand at an impressive 18 mpg in the city and 23 mpg on the highway. Base trim levels deliver limitless thrills and will reach 60 mph in 5.4 seconds. Jaguar F-PACE S models employ a refined 3.0-liter supercharged V-6 engine that makes 380 horsepower and will vault you from zero to 60 mph in just 5.1 seconds. Do you put more emphasis on fuel economy? Drivers who value fuel economy will love the 180-horsepower 2.0-liter turbodiesel four-cylinder power platform that is paired with an eight-speed automatic transmission. With an impressive 318 pound-feet of torque, the diesel-powered Jaguar F-PACE will deliver a memorable drive and will make an efficient 26 mpg in the city and 33 mpg on the highway. If you are interested in an athletic performance in the luxury crossover class, the 2017 Mercedes-Benz GLE may fall short of expectations. Under the hood, the stock Mercedes-Benz GLE employs a lackluster 302-horsepower 3.5-liter V-6 engine that is married to a seven-speed automatic transmission. Fuel-economy ratings for the rear-wheel drive Mercedes-Benz GLE stand at 18 mpg in the city and 23 mpg on the highway - numbers that drop to 18 mpg in the city and 22 mpg on the highway with 4MATIC All-Wheel Drive. Mercedes-Benz GLE models upgrade performance with a 329-horsepower 3.0-liter turbocharged V-6, a plug-in hybrid powertrain and a 5.5-liter turbocharged V-8 available for the Mercedes-AMG GLE63. Explore the all-new 2017 Jaguar F-PACE when you visit Barrett Jaguar in San Antonio!